Elite DC 1000CSW Power Back Up System for Old CSW200 Models. Special Order Item. Elite HCT Hercules is an overhead door opener and gate opener (also known as a Elite gate operator or Elite gate motor). The HCT is a heavy duty high traffic gate operator built to include a Security+ receiver, built-in electronic reversing device, heavy duty track and keyed trolley assembly. Elite Omni Board upgrad kit compatible with SL3000 Slide Operators, CSW200 Swing Operators. Includes: ELI-Q400, ELI-Q410, Reset button and instructions. Elite DC2000CSW Power back up system keeps traffic moving during a power outage. The Elite DC2000CSW Power Battery Back-up System is compatible with all the Chamberlain Elite CSW200 models except for the CSW200 1HP. Chamberlain Elite DC-2000 SL power back up system for select Elite commercial gate operators. Keeps traffic moving during a power outage. The Elite DC2000SL Power Battery Back-up System is compatible with all the Chamberlain Elite SL3000 models except for the SL3000 1HP. Elite Miracle one arm and Miracle two replacement ARM Only. For residential or commercial swing gate operators by Elite. This Model Is Discontinued. Please see Elite OMNIUP Omni Board Upgrade Kit as a possible replacement. Elite Q207 #60 Gear Box Assembly for Elite CSW200 gate operators built before October 1995. Elite Q222 Control Board for Elite Miracle One Arm (Single Operator). 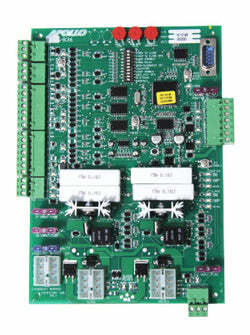 Elite Q223 Control Board for Elite Miracle One gate operators operating as a master / second arm. 33 - Elite Q244 CSW200 Cover HD Polyethylene. Elite Q244 Cover HD Polyethylene for CSW200 and Robo Swing gate operators. Elite 02-51227 Stop / Reset Button for Elite SL 3000UL slide gate operators. Elite 16-20424 Belt for Elite SL3000 UL 1/2 HP battery backup. 43"
Elite 16-51209 Belt for Elite SL3000 UL 1/2 HP. 31.5"
Elite 16-51219 Belt for Elite SL3000UL 1HP. 42"
Elite 24-51233 Brake Solenoid Relay for Elite SL3000UL slide gate operator. Elite 32-50091-10 Backdriveable Gear Reducer for Elite SL3000 Slide Gate Operator. Elite 77-50382 Hardware Kit for Elite SL3000and Elite Robo Slide Gate Operators. Elite Accessdoor Access Door for Elite Robo Swing and Elite CSW gate operators. Elite DC2000 Controller Only for Elite SL3000 and Elite CSW200 Gate Operators. The DC2000 is compatible with all Chamberlain Elite SL3000 and CSW200 models except for the 1HP models. Elite G6518CSW 120V heater for CSW200 Swing Gate Operators. Protects systems to -40 degrees F.
57 - Elite G6518SL Heater for SL3000UL. Elite k23-511858 Reset Button for Elite SL3000UL Slide Sage Operator. Elite K45-50676 Thumbscrew for Elite Robo Swing. Elite Hand Crank Pocket K75-50932 -Elite New Style Hand Crank Pocket to store hand crank (Crank Q028 is Not Included) for Slide Gate Operator SL3000. Elite k76-51230 Solenoid Brake for the Elite SL3000UL Slide gate operator. Elite Q006 PC Board Nuts - PC Board Nuts for Slide Gate Operator SL3000UL, CSW200, Elite Robo Swing and Elite Robo Slide. Elite Q009 Electronic Access Panel Cover for Elite Robo Swing Gate Operator. Elite Q014 Drive Sprocket -Drive Sprocket for Slide Gate Operator Elite SL3000 UL. Elite Q015 Gear Reducer - Gear Reducer for Slide Gate Operator SL3000UL. Elite Q022 Electronic Box for Elite Robo Swing Gate Operator. Elite Q027 Motor Capacitor Motor Capacitor for Slide Gate Operators SL3000UL and CSW200. Elite Q032 Limit Switch Adjustment Nuts - Limit Switch Adjustments Nuts for Slide Gate Operator SL3000 and Robo Slide. Elite Q049 Sprocket 50B16 for Elite Robo Swing Gate Operator. 100 - Elite Q051 Collar 1/2"
Elite Q054 Gate Adjustment Shaft for Elite CSW200 Swing gate operator. 104 - Elite Q057 CSW Sprocket / Chain Kit. 105 - Elite Q058 Output Shaft 2-1/2"
Elite Q062 Cludge Cover Stainless Steel for Elite CSW200 and Elite Robo Swing Gate Operators. Elite Q065 Elite Q065 Drive Belt for(DM) BBUP Model DC2000SL. Elite Q084 Emergency Key Release for Elite CSW200 and Elite Robo Swing gate operators. Elite Q101 Limit Switch Bearing Holder - Limit Switch Bearing Holder for Slide Gate Operator SL3000 UL and Elite Robo Slide gate operators. Elite Q103 uphill arm for CSW200 gate operators. Elite Q104 Standard Arm Package for CSW200 and Robo Swing Gate Operators. Elite Q118 Key For Access Door for CSW200 and Robo Swing Gate Operators. Elite Q124 Chassis for Robo Slide gate operator. Elite Q131 Limit Switch Drive Sprocket for Elite Robo Slide Gate Operator. Elite Q137 Limit Switch Box for Elite Robo Slide Gate Operator. Elite Q143 Motor Mounting Plate DC Backup for Elite SL3000 UL slide gate operator. 129 - Elite Q156 Collar 3/8"
Elite Q160 Long Gate Kit for Elite SL3000 slide gate operator. Elite Q180 1" Coupling for Elite Robo Slide Gate Operator. 139 - Elite Q181 Coupling 2-1/2"
140 - Elite Q183 Sprocket B50-16. This Model Is Discontinued. Please see Elite K75-50117 as a possible replacement. Elite Q217 Sprocket Gate Adjustment for Elite CSW200 Swing Gate Operators. Elite Q218 Terminal Harness for Elite Robo Slide gate operator. Elite Q230 Steel Bracket Mounting Plates (2) for Elite Miracle One Arm. Elite Q232 Bottom Washer and Nut for Elite Miracle One Arm. Elite Q233 Bolt, Brushing and Nut for Elite Miracle One Arm. Elite Q241 Polyethylene Plastic Cover for Elite Robo Swing gate operator. Elite Q262 Motor Harness with Flex Conduit (operator cord) for Elite Miracle one arm. Elite Q268 Cludge Cover Plastic for Elite CSW200UL and Robo Slide Gate Operators. Elite Q300 Traveler Carriage for Elite Miracle One Arm. Elite Q302 Set of Arm End Caps for Elite Miracle One Arm. Elite Q400 MAU Plug-In Relay Adapter Module is for use with gate operators that use the Elite Access control board. This easy to integrate module in combination with the control will facilitate the control and operation of external accessories such as Solenoid locks or Magnetic Locks. The relay (form C 2A 125 Volts AC/DC) is capable of switching loads up to 2 amps. Elite Q408 Omni Switch Channel for Elite CSW200UL and Elite SL3000 gate operators. Elite Q409 Electronic Access Panel for Elite CSW200 and Elite SL3000 gate operators. Elite Q420 Omni Motor Harness - Omni Motor Harness for Elite SL3000 Slide Gate Operator. Elite Q520 Omni Motor Harness for the Elite CSW200 Swing Gate Operator. Elite Q523 DM/1HP Hardware Service Kit for Elite CSW200 Swing Gate Operator. Chamberlain Elite CSW200UL8 1HP Commercial Swing Gate Opener (also known as a Elite swing gate operator or Elite swing gate motor) with unique patented dual motor system. This reliable gate opener can handle gates up to 1000 lbs. and 20 ft. long. It is capable of handling 60 cycles per hour. This Model Is Discontinued. Please see Liftmaster RSL12U as a possible replacement. The Elite Roboslide Slide Gate Opener Residential 12VDC is a slide gate opener (also known as a Elite slide gate operator or Elite slide gate motor) comes with battery back-up, 3 FREE Liftmaster remote control transmitters and a 315MHZ receiver included. Roboslide can handle a gate leaf up to 20 ft. or 800 lbs. and 120 cycles per day. Transformer APOW1 is included with the Roboslide. Elite SL3000UL8 slide gate opener (also known as a Elite slide gate operator or Elite slide gate motor) 1HPH3 is a heavy duty slide gate operator with a 1 HP motor and a built-in heater. The SL3000UL8 1HPH3 can handle 35 cycles per hour and gates up to 2000 lbs. and 37 ft. in length. This product is considered a special order item and requires a lead time of 10-14 business days. If you require a specific delivery date, please contact us directly. Elite SL3000UL8DCE3 slide gate opener (also known as a Elite slide gate operator or Elite slide gate motor) commercial heavy duty slide gate operner includes a 1/2 HP motor with a pre-installed LiftMaster receiver and battery backup. This *E* model can be back-driven by hand for emergency access when there is a power outage. Additionally, when power is present there is a convenient, easy-to-identify emergency release button located on the front cover of the gate operator. Press it once to disconnect the operator, and press again to reset the operator. Can handle continuous duty / cycles daily and handles gates up to 1000 lbs. and 37 feet in length. This product has a 2-3 week factory lead time. Elite SL3000UL8DC slide gate opener (also known as a Elite slide gate operator or Elite slide gate motor) commercial heavy duty includes a 1/2 HP motor with a pre-installed LiftMaster receiver and battery backup. Can handle continuous duty / cycles daily and handles gates up to 1000 lbs. and 37 feet in length. Elite SL3000UL8 DM slide gate opener (also known as a Elite slide gate operator or Elite slide gate motor) DCH3 with battery backup is a heavy duty slide gate opener that uses a unique, patented dual (1/2 HP) motor feature. Because of this feature, this operator can work in high ambient temperature conditions. Handles continuous cycles daily and gates up to 800 lbs. and 37 ft. in length. Receiver, heater and battery backup system included! Elite SL3000UL8 slide gate opener (also known as a Elite slide gate operator or Elite slide gate motor) DMDC with battery backup is a heavy duty slide gate opener that uses a unique, patented dual (1/2 HP) motor feature. Because of this feature, this operator can work in high ambient temperature conditions. Handles continuous cycles daily and gates up to 800 lbs. and 37 ft. in length. Receiver and battery backup system included! Chamberlain Elite SL3000UL8DM slide gate opener (also known as a Elite slide gate operator or Elite slide gate motor) is a heavy duty slide gate operator uses a unique, patented dual (1/2 HP) motor feature. Because of this feature, this operator can work in high ambient temperature conditions. Handles continuous cycles daily and gates up to 800 lbs. and 37 ft. in length. Receiver included! Chamberlain Elite SL3000UL8 DMH3 slide gate opener (also known as a Elite slide gate operator or Elite slide gate motor) heavy duty slide gate operator uses a unique, patented dual (1/2 HP) motor feature. Because of this feature, this slide gate opener can work in high ambient temperature conditions. Handles continuous cycles daily and gates up to 800 lbs. and 37 ft. in length. Receiver included! Heater is built into this model. LIMITED TIME PROMOTION! Elite SL3000UL8E3 slide gate opener (also known as a Elite slide gate operator or Elite slide gate motor) is a heavy duty commercial slide gate opener equipped with a 1/2 HP motor. This continuous duty machine is for slide gates up to 1000 lbs. and 37 ft. Comes with a pre-installed LiftMaster receiver. This *E* model can be back-driven by hand for emergency access when there is a power outage. Additionally, when power is present there is a convenient, easy-to-identify emergency release button located on the front cover of the gate operator. Press it once to disconnect the operator, and press again to reset the operator. This model has a 2-3 week factory lead time. The Elite SL3000UL8 H3 slide gate opener (also known as a Elite slide gate operator or Elite slide gate motor) is a slide gate opener with built-in heater recommended for high traffic applications. Designed for smooth, quiet performance. This gate operator is meant to handle continuous operation with gates weighing up to 1000 lbs and up to 37 feet long. Travels at 12 inches per second.